A federal judge in Manhattan has ruled that the largest of the six lawsuits against the new citizenship question on the 2020 census can move forward in court. More than two dozen states and cities, plus other groups and individuals, are suing the Census Bureau and the Commerce Department, which oversees the census, to get the question about U.S. citizenship status removed from forms for the 2020 census. Judges in Maryland and California are deciding whether to dismiss similar legal challenges. While U.S. District Judge Jesse Furman has dismissed the plaintiffs’ claim based on the Enumeration Clause — the constitutional requirement of a national head count every 10 years — Furman has ruled that other claims in the two cases before him can proceed. In his opinion released on Thursday, Furman said that the plaintiffs “plausibly allege that Secretary Ross’s decision to reinstate the citizenship question was motivated at least in part by discriminatory animus and will result in a discriminatory effect.” Still, the judge noted that Commerce Secretary Wilbur Ross, who approved adding the citizenship question, has “broad authority” over the census. “Plaintiffs may not ultimately be able to prove that he exercised that authority in an unlawful manner,” Furman wrote. The two cases in New York City now move forward towards a potential trial that would start as early as late October. At a hearing on July 3, Furman said it was “unlikely” he would dismiss the case in its entirety as the Trump administration requested. Citing internal documents released as part of the lawsuits by the Commerce Department, which oversees the Census Bureau, Furman said there was evidence suggesting the administration acted in “bad faith” by adding the citizenship question. 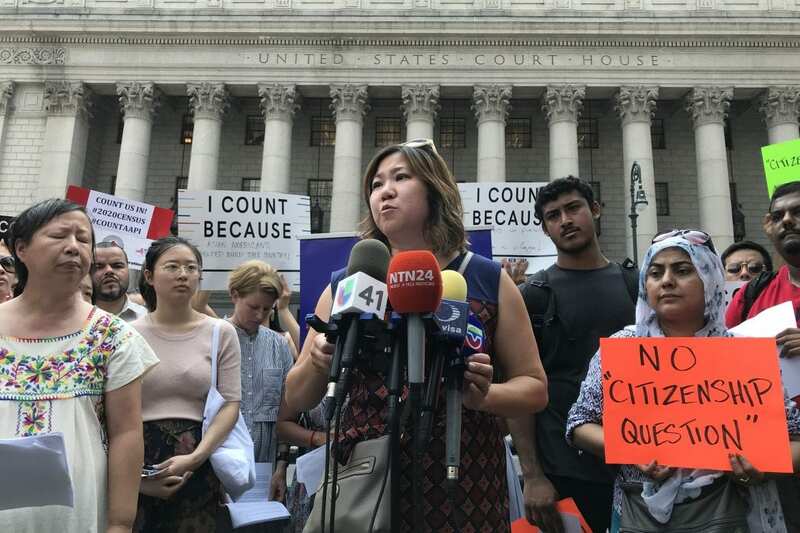 After the hearing, Rep. Grace Meng, D-N.Y., and members of the New York Immigration Coalition and other critics of the citizenship question gathered outside the courthouse to celebrate Furman’s announcement. Commerce Secretary Wilbur Ross announced his approval of the citizenship question in March. Internal documents the Commerce Department has filed in court as part of the lawsuits, however, raise questions about exactly why Ross made that decision. In a memo filed last month, Ross contradicted his testimony from a congressional hearing in March, when he told lawmakers that the Justice Department “initiated” the request for the question because the department needs a better count of voting-age citizens to enforce the Voting Rights Act’s provisions against racial discrimination. Ross disclosed in his latest memo, however, that before he received the DOJ’s request, he and his staff asked the department if it would submit a request for a citizenship question – a request that he would later approve. The commerce secretary also wrote in the memo that he began considering adding a citizenship question “soon after” he was confirmed for the position in February 2017. The topic, he noted, was discussed by other senior Trump administration officials. In an internal email released by the Commerce Department, Kris Kobach — the Kansas secretary of state who once helped lead President Trump’s now-defunct commission on voter fraud – wrote that he contacted Ross about a citizenship question “at the direction of Steve Bannon,” the former White House strategist. During the July 3 hearing, Judge Furman ordered the Commerce and Justice departments to release additional internal documents related to the decision to add the citizenship question to supplement the more than 1,320 pages the Trump administration released in June. Some of those documents were released on Monday. Furman is also allowing lawyers in the New York-based cases to depose up to 10 officials from the two departments. The Constitution requires a head count of every person living in the U.S. every 10 years. The Census Bureau has not asked all U.S. households about citizenship status since 1950. After the Voting Rights Act was enacted in 1965, the federal government has enforced Section 2 of the law using estimates of voting-age citizens from a sample survey conducted by the Census Bureau that’s now known as the American Community Survey. Census Bureau researchers, including its chief scientist, have warned against adding a citizenship question to the 2020 census form because of fears of discouraging noncitizens — and any U.S. citizens living with them in the same households — from taking part in the head count. That would harm the accuracy of influential population counts that are used to reallocate seats in Congress among the states, draw legislative districts and distribute an estimated $800 billion a year in federal funds. The impact of an undercount in the 2020 census would also be felt among businesses, health researchers and pollsters who rely on the federal government’s demographic data.